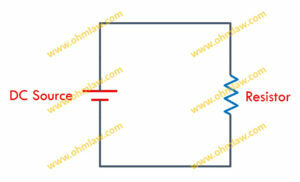 The simple Ohm’s Law Circuit Diagram comprises a resistance connected in series with a DC voltage source. Two parallel lines having one with comparatively larger length represents the DC Source and a Zig-Zag symbol represents the resistor. Whereas the simple lines are used to represent the wires. Let’s understand the components of our circuit diagram. Battery: It is the dc voltage source which provides power to the internal circuit. As we studied the Ohm’s statement: V = IR. Actually, V is the battery or voltage source which powers the entire circuit. Ammeter: It reads the current that flows through the entire circuit. 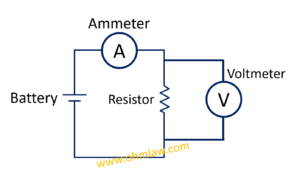 Remember that an ammeter always connects in series to the circuit. Voltmeter: It reads the voltage across the resistor. Remember that a voltmeter always joins in parallel to the component. Now let’s start learning the basic mathematics of law using 5 Different Examples. Example 1: A 10V battery connects in series with a 20k ohm Resistance. Find the current flowing through the circuit. Solution: Using V1 = I1 R1. Example 2: A 15V source connects with an unknown resistor. The value of current is measured as 5 mA. Find the value of R.
Example 3: A 50k Resistor joins with a 25VDC Variable Supply. Find the value of unknown current that is flowing through this circuit. Example 4: The power dissipation through a 29k Resistance is 15watt. Find the value of current and input voltages supplied by the source. Solution: Here the formulas: I = SQRT(P/R) and V = SQRT(P*R) will be used. You can learn about all these formulas from Ohmic Wheel.